« Welcome to the Mason Grove Experience!! Now that’s what I call a rout!! Employing a withering defense Tuesday, the Coupeville High School JV girls basketball squad came within a single lucky shot of completely blanking visiting Port Townsend. But, after a bounce here, a bounce there, a wild RedHawk shot found the bottom of the net two minutes into the fourth quarter, and the Wolves had to “settle” for just a 27-2 win. The victory lifts Coupeville’s young guns to 2-1 in Olympic League play and evens their overall mark at 6-6, best of any of the four Wolf hoops squads this season. The game was essentially over as soon as Nicole Lester slipped a free throw through the net two minutes into the game. But, just in case that 1-0 lead wouldn’t hold up against the super-cold-shooting RedHawks, Mollie Bailey pulled up and netted a sweet jumper while on the move to seal the deal at 3-0. From there, it was nothing but easy street for the Wolves, as they stretched the margin to 7-0 after one, 15-0 at the half and 22-0 after three quarters. Port Townsend had at least two shots start to go down, then pop straight back up and out, as Coupeville’s mysterious invisible defender did her job superbly. 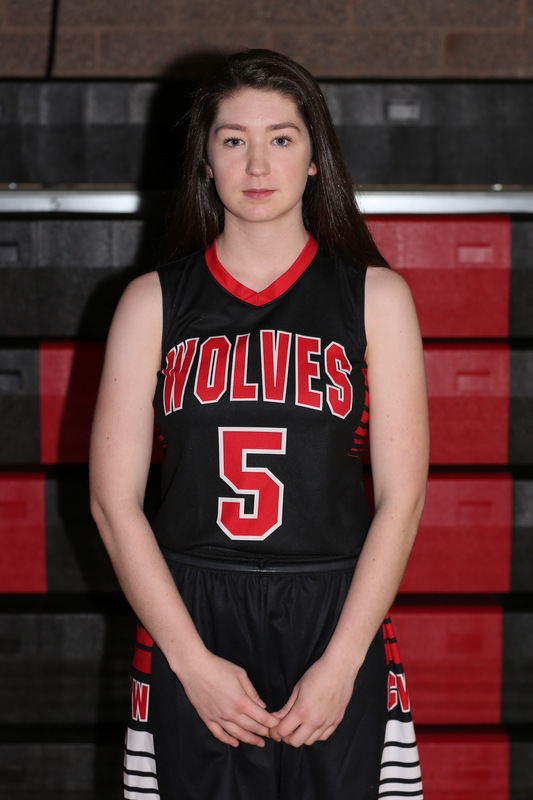 On offense, it was the Ashlie Shank show, as the Wolf guard rained down a game-high 10 points, while twice beating the clock. Shank closed the second quarter by driving right up the middle against a fleeing defense as the clock ticked madly away, getting hammered on the arms on a buzzer-beating three-ball try. While her trey didn’t drop, all three of her free throws whispered sweet nothings to the net as they softly slipped through. Just to prove she truly has the heart of a killer lurking underneath her friendly exterior, Shank pulled up and splashed a jumper a half tick before the clock hit 0:00 in the third. That rightly earned an appreciative nod and smile from her dad, Coupeville Schools Superintendent Dr. Jim Shank. The Wolves spread their scoring out, with seven of the eight players in uniform scratching their names into the scoring column. Lester hit five free-throws, while Maddy Hilkey (3), defensive beast Tia Wurzrainer (3), Bailey (2), Avalon Renninger (2) and Genna Wright (2) all tallied points. Spanish sensation Julia García Oñoro came dangerously close to netting her first American basket. While the ball wouldn’t drop for her, the foreign exchange hoops star, who is learning the game as she goes, provided hustle on defense and an enthusiastic welcome back to the bench for each of her teammates.